It would appear that I only write a blog at Christmas time! Must be more motivated and share some more wise words with you all… however, please find below some examples of last years wreaths for those of you wanting to order yours for the this year. All wreaths are £40. I still have one or two free evenings for anyone wanting to organise a wreath workshop as home - such a super way to start of the Christmas festivities with friends. I hope you have all enjoyed yourselves.. I certainly have...well done to all you ladies (sadly no gents this year...!) who have created their own wreath. We have had more than ever to choose from from bright pink neon birch twigs and rose gold sparkly thistles, to dried hydrangea and traditional cinnamon stick bundles. Not to forget our favourite birds. I am always amazed that there is never one the same! Here is just a couple of pictures for you. A lot of people have asked about Easter workshops, I'm thinking and will get back to you in the New Year! Anna and Charlie married in the Grosvenor Chapel on a beautiful September day. We had the pleasure of providing the bouquets for the beautiful bride and her lovely flower girls. A simple and striking colour scheme of white and green with hints of blue. An abundance of hydrangeas which are at their best at this time of year, a good starting point for any September wedding. Also featuring white avalanche roses, akito roses, lisianthus, gypsophila and seeded eucalyptus. I have spent the last month stockpiling every pine cone, orange, cinnamon stick, bauble, candy cane, butterfly, bird, feather and ribbon variety known to man! Wreaths are available to order now! All wreaths bought from my website are £30 and include local delivery (London SW13, SW14, SW15, SW18). Please get in touch and let me know whether you would like natural, fun or glitzy and if you have a preferred colour scheme. 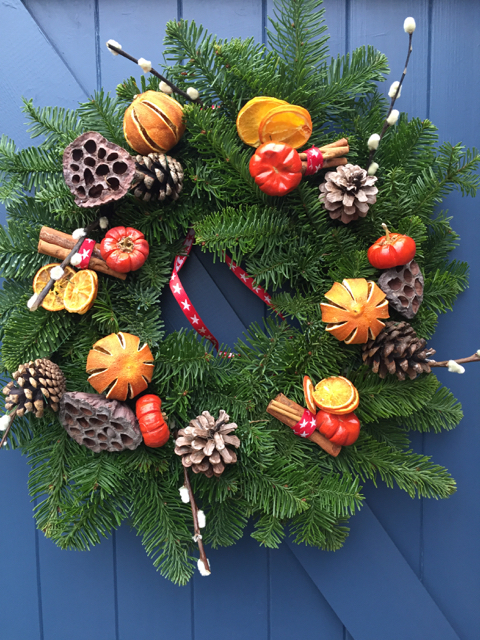 Bookings are now being taken for our Christmas Wreath Workshops in the South West London Area. 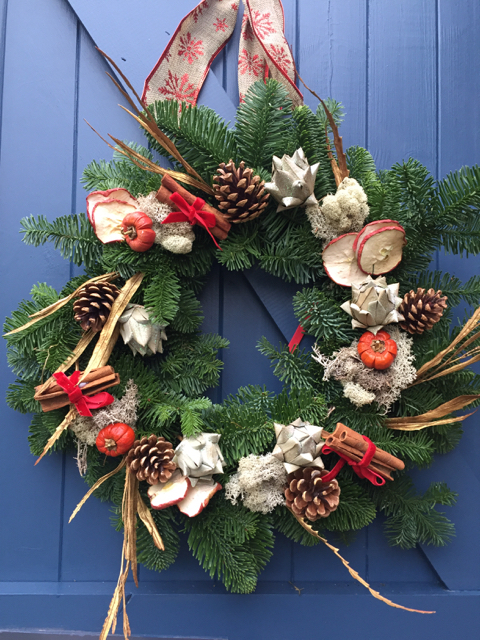 Get together with a group of friends and host a wreath making workshop – Colleagues, NCT Groups, School Mums, Hen Parties, A good reason for a Christmas Party?? I come to you armed with all the materials needed to make some fabulous wreaths for Christmas. I show you what to do and help you create your own – all that is left for you to do is hang them on the front door once I’m gone! We are ideally looking for a minimum of four people per workshop – the max is the size of your kitchen! Amy and Chris chose Hampshire as a beautiful location for their September wedding and the sun shone for them late into the afternoon. 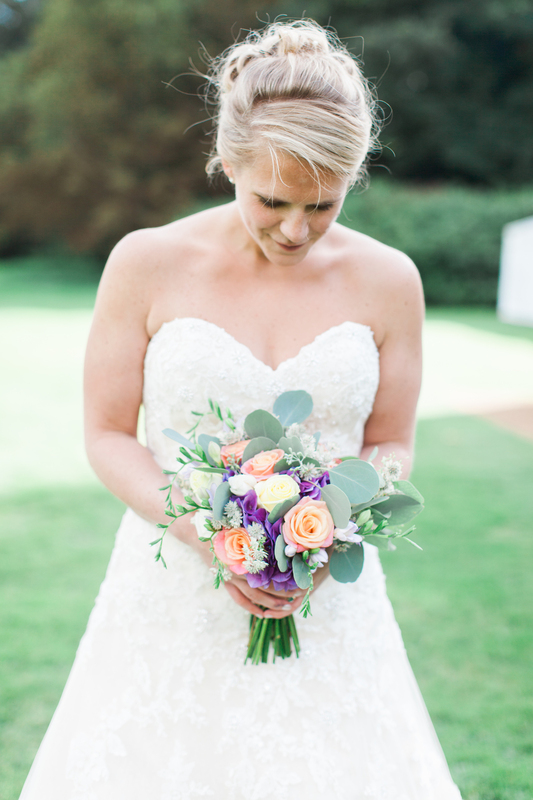 Amy chose flowers in shades of Coral, Purple, Yellow and White so we were able to use gorgeous roses (Miss Piggy and Akito), Hydrangea, Delphiniums, Lisianthus and Astrantia. 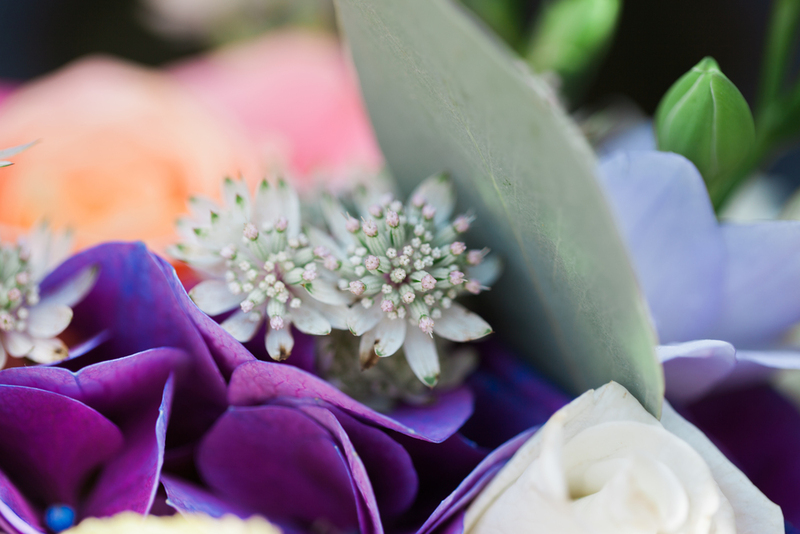 Delayed but beautiful pictures of the last of my spring bouquets. 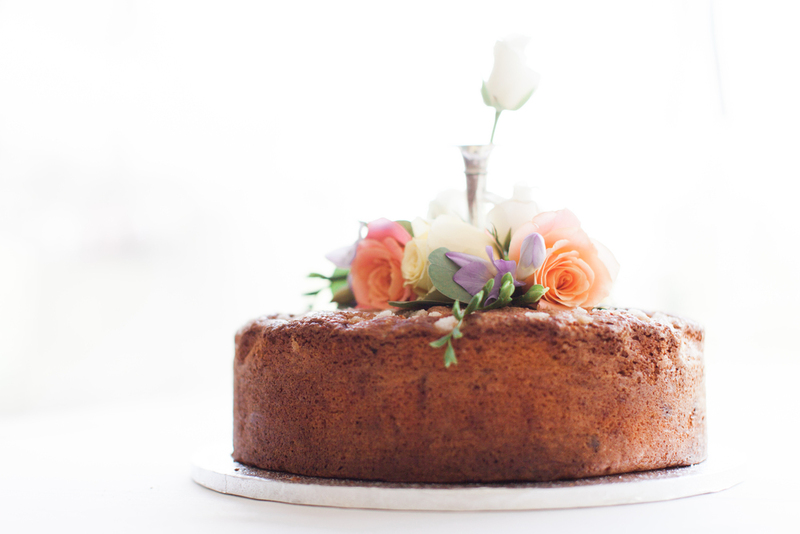 As I write we are well into the summer weddings but these are too good to miss. A vibrant colour scheme chosen by Anna for her and her bridesmaids. 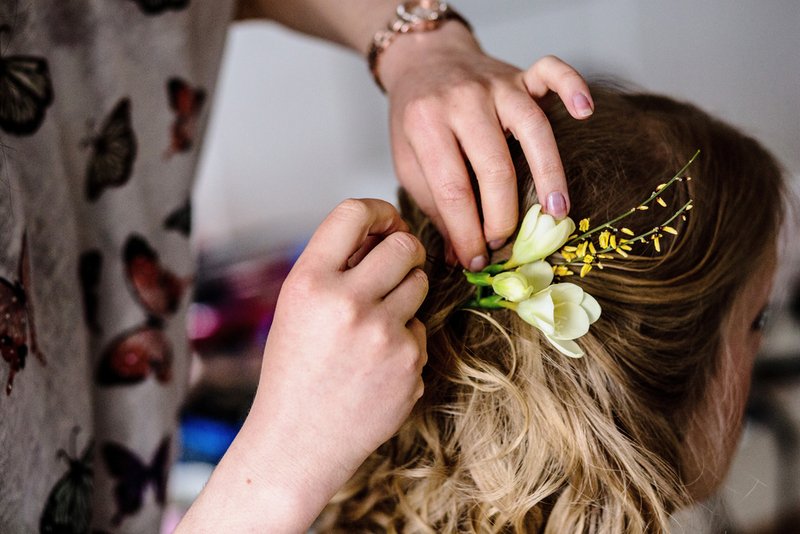 "We have had so many emails and phonecalls since the wedding from people saying how utterly wonderful the flowers were and praising your skills. Temple church looked better than it has ever looked before. It was super to walk through the door and navigate between the two beacons of yellow daffodils and up to the altar and those magnificent planters." 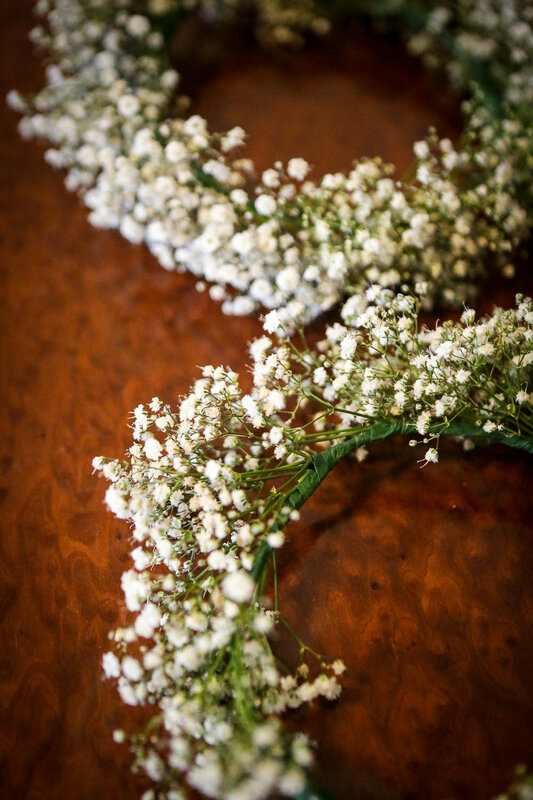 "The bouquet, posies and stick posies were marvellous and really brought spring to the day. The cake looked spectacular and the profusion of daffodils in Ev were truly breathtaking. It was as I hoped x 1000 times better."